This blog post shows how to assign Dymola model parameters to elements of a structure stored in a .mat file. 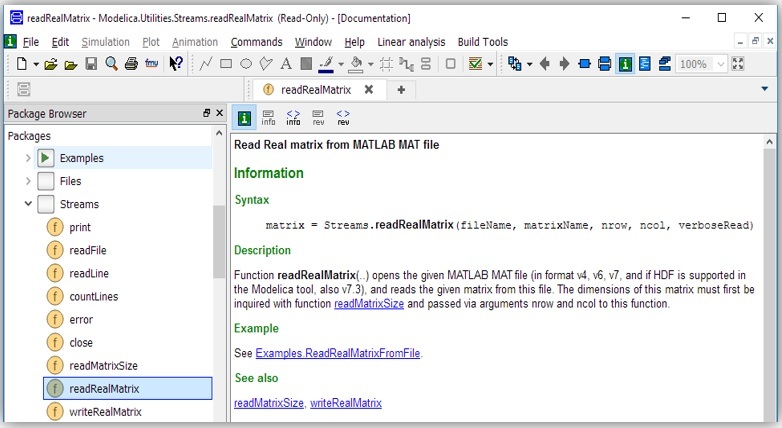 In Modelica 3.2.2 a new function is introduced called Modelica.Utilities.Stream.readRealMatrix() which allows users to read a Matlab .mat file saved in the v4, v6 or v7 formats (see Figure 1). Version 7 formatting is used in this blog post as this format supports the reading of data structures in Dymola 2017. Figure 1: The information layer of the Modelia.Utilities.Stream.ReadRealMatrix() function. Note that, on one hand, the readRealMatrix function in Figure 1 can only read real matrices with 2 dimensions, but on the other hand, both Dymola 2017 and 2017 FD01 do not support the v7.3 format. 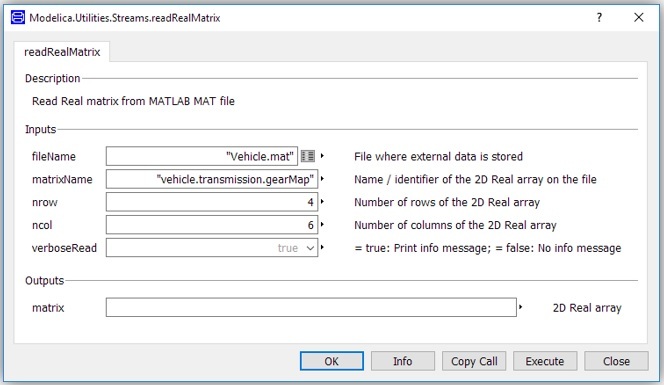 For the purpose of illustrating how to assign a Dymola model parameters to elements of a data structure stored in a .mat file, first we need to create a data structure and store in a .mat file either using Octave or Matlab® as in Figure 2. Figure 2: Octave commands to create a simple data structure and save it with matlab-v7 format. An example of extracting the matrix created above from the stored .mat file using the readRealMatrix function is shown in Figure 3. Figure 3: An example of using the readRealMatrix function. By executing the above function, you will see the following result in command log pane of the Dymola command window. Alternatively, this function can also be used in Modelica classes. Two such examples are illustrated below : (1) with a known matrix dimensions and (2) with an arbitrary matrix dimensions.